Applications are due May 1, 2019. Click for more details and the application forms. The following letter to the editor was published in the December 28, 2018 issue of The Daily Courier. Thank you, John, for the letter of support! As a supporter of arts and education, and as a library district board member, I’d like to share some information about a great tax credit opportunity for all Oregonians. Residents of Oregon who contribute to one of 1,400 Oregon cultural nonprofits, including the Josephine County Library Foundation, can receive a state tax credit of up to $500 per individual or $1,000 per household. Donors simply add up all the contributions they’ve made to qualifying nonprofits, then make a matching contribution to the Oregon Cultural Trust by Dec. 31 for a 100 percent credit to directly reduce 2018 Oregon income taxes. Our local libraries have received $51,572 in direct grants from the Cultural Trust, and Josephine County has received $239,375 including support from the Josephine County Cultural Coalition, which makes grants locally using the same tax funds. Oregon is the only state that offers an opportunity to give directly to local cultural nonprofits and get a tax break. I encourage everyone to take advantage of this opportunity to give to nonprofits in Josephine County and receive a tax credit this year. To make a donation for 2018 and to find out if you’ve already given to a qualifying nonprofit, visit the Oregon Cultural Trust website. The Boys & Girls Club 2018 grant funded materials for art work for the children. Here is a sample of the work. The exhibit is now showing at the Shops at 6th & G Streets. The art will remain up through December 30, 2018. 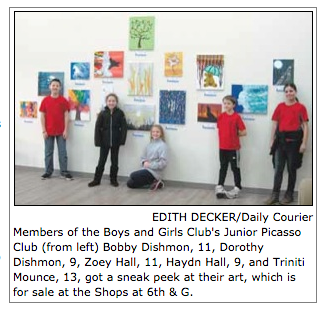 For more information on purchasing the children’s work, contact Clarissa at 541-476-5258. Have you donated to the Cultural Trust yet? Now’s the time as you will receive a Tax Credit when you do your taxes. The 3 Rivers Chorale used grant funds from Josephine County Cultural Coalition to purchase a trailer for their equipment. Follow this trailer to get to a great chorale performance! After we have reviewed the grant proposals, we’ll announce the awarded grant projects in December 2018 on this website. For all of you who submitted a proposal, thank you for continuing to promote the arts and culture in Josephine County! Join us in supporting the arts and culture!! This project was supported by JCCC and Haines & Friends. We hope you will support these groups in their efforts to enhance the arts, culture, and heritage of our community of Josephine County!! Josephine County Cultural Coalition helped support the WCST’s fundraiser: An Evening to Remember. The GP Museum of Art was granted monies for Elementary students to visit the Museum for arts instruction. We visited the Museum during one of the classes. The students were engaged with their attention to their instruction into the world of art! The Josephine County Cultural Coalition is thrilled to have been recognized by Senator Jeff Merkley for its work, particularly for its support of the Frederick Douglas exhibit at the Grants Pass library throughout January 2018. At a January town hall meeting, Senator Merkley presented a flag flown over the U.S. Capitol to members of the JCCC board. With your help, the coalition will continue to serve the Arts, Heritage and Culture of our community. We hope you had a chance to see their presentations!! The Josephine County Cultural Coalition works to foster a culturally rich community in Josephine County by encouraging participation in the arts, heritage, humanities, and culture through education, activities, fundraising, and grant awards. The coalition is part of the Oregon Cultural Trust network. Click to learn more about the Josephine County Cultural Coalition. Click to contact us.